The recent debate about the management of flying-foxes in Cairns set me to wondering about the history of their interaction with Europeans in the Far North. Cairns’ old newspapers, the Cairns Morning Post, The Morning Post, and the Cairns Post from the period 1884 to 1954 are a relatively quick means of getting a glimpse into this. It turns out flying-foxes have been media stars in FNQ for over a century now. From 1889 onwards reports of flying-fox damage to crops were a regular newspaper feature along with reports of growers’ insistence that flying-fox depredation would send the industry to the wall. There were frequent demands for Local Council and Government support for control activities, only some of which were acceded to. In the mid-1920s the Cairns Post reported that despite having operated for many years, the Flying-fox Destruction Boards had conceded defeat and requested that the Commonwealth begin research on how to control the animals. This request led to the funding of the first flying-fox research project, conducted by Francis Ratcliffe, and some years later his visit to the region and his final reports were the focus of much detailed reporting. In the very early days flying-foxes in the settlements of Far North Queensland themselves don’t appear to have warranted much mention. Their presence was indicated by grumblings about their visits to garden fruit trees and mention of their flights at night in articles, letters and columns. There is also indirect evidence; for example, in 1901 a fire in Mossman was reported to have disturbed the flying-fox roost in the town. Other articles suggest that flying-fox shooting was common in towns. For example, a number of reports of injury to persons give the context as being shot or otherwise injured while shooting flying-foxes. 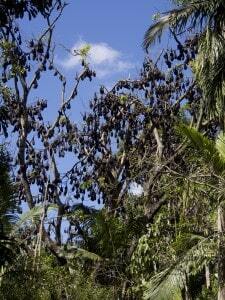 Similarly, a suicide was initially missed because the wife assumed her husband was shooting flying-foxes, not himself. In a legal altercation in Babinda the recent use of a weapon was explained as due not to homicidal urges but rather to flying-fox shooting. From the end of the First World War specific mention of organised shooting of flying-foxes in towns to disperse them becomes more common. Shoots were reported in Charters Towers in 1916 and 1927 and 1935 (in that event a “respectable number” of flying-foxes were shot and four humans “peppered”).In 1932 flying-fox shooting at Tolga Scrub, a nature sanctuary, had reached a point that it was considered a public safety issue and the police became involved. Shoots were also reported at Midgenoo and Mareeba in 1937 and in Cooktown in 1939 and 1940 (despite this the flying-fox camp was reported to be within feet of Cooktown’s post-office in 1946). In 1941 it was reported that an application to hold a shoot at the camp in Mirriwinni was refused by the Council and in April 1953 Douglas Shire Council declined to supply ammunition for a shoot in Pt Douglas. Much of what appears in these old newspapers is very familiar from our recent debates about flying-fox management in the towns of FNQ and serves to highlight that despite implementing extreme measures repeatedly over the last century we have yet to find a long-term solution to learning to live with them. It is clear that as a community we need to start thinking very differently about solutions and mitigation.